I have been shucking oysters for many years and I have a few knives that I tend to use more than others. In particular, I have three favorites that I use most of the time. It is rare that a new knife becomes one of my go-to knives but that just happened with the Put em’ Back Oyster Knife by Toadfish that we recently tested. Things that make this knife unique and earn a top spot in our rotation include the color, the beauty, the well designed Toadfish™ blade, and most importantly: the contoured handle. The knife has a substantial feel and weight, and a longer blade with a narrow but blunt tip. The handle, made out of recycled and sustainable materials, has a comfortable and slip-free indentation for your thumb and one for your index finger. This allows for added safety and comfort while shucking. 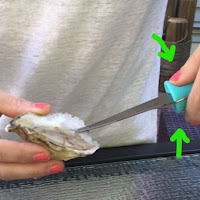 The knife "was developed from generations of oystermen. 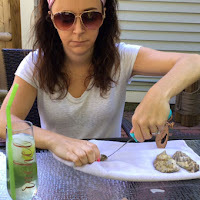 It combines all the elements of a traditional oyster knife with a modern look at ergonomics and the physics of shucking an oyster perfectly and safely," the Toadfish website describes. Did we mention the warranty yet? I don't think any of my other knives came with a warranty. The Toadfish oyster knife comes with a two-year limited warranty. They will either repair or replace your knife if it has defects. Do you feel better about supporting products and brands that give back? Well, you will be pleased to know that for every product purchased, Toadfish donates the funds needed to plant 10 sq. feet of oyster habitat. 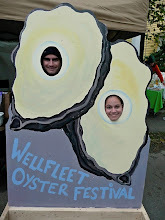 By now, we hope all of our readers understand the benefits of oysters in our waters. For those who do not, when your Toadfish knife arrives in the mail just look at the packaging for a reminder that "a single oyster filters 60 gallons of water per day." Additionally, Toadfish has partnered with the Coastal Conservation Association of South Carolina and has recently donated twenty thousand dollars to the organization's habitat efforts. With a motto of "shuck, recycle, rebuild," Toadfish is living up to its mission of being a good corporate citizen. The Toadfish Set-Custom Engraved - 3 Custom Engraved PUT ‘EM BACK Oyster Knives in an elegant wooden box. You can also find Toadfish hats and shirts online here. 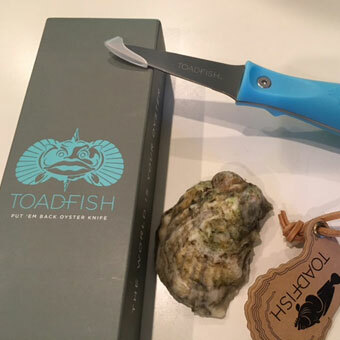 When you shop at Toadfish, tell them your friends at Go Shuck an Oyster sent you and then comment below to let us know what you think of their oyster shucking knife. If you prefer to shop at Amazon, the Toadfish oyster shucking knife can be found on Amazon by clicking here. At the time of this post, all four reviews on Amazon rated the knife with 5 stars.